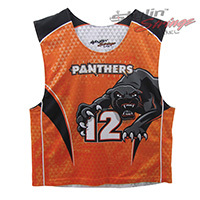 The Central York Panthers sublimated lacrosse reversibles are a fully custom design. From the panther logo to the idea to have it wrap around the pinny and claw the number on the front. The pattern of triangles was also custom made to give the design some of our signature subtle texture. The body lines were also unique using a cut in arrow style to keep a claw style curvatious look.